This entry was posted in Recovery & Support and tagged Alcohol Abuse and Addiction, Friends and Family of Addicts on June 8, 2016 by Team Addiction Hope. Just because your alcoholic spouse has completed a rehabilitation program does not mean that the challenge of achieving recovery is over. Maintaining sobriety is a daily struggle, and the alcoholic in your life is going to need your support. Whether or not to keep alcohol in the house is an issue you will need to discuss with your partner, but there are a number of reasons why it’s best to remove any temptations that can result in a relapse. As the spouse of a recovering alcoholic, one of the best gifts you can give is making sure that your home is a positive environment conducive to living a sober lifestyle. Having easy access to alcohol makes it very tempting to start drinking during times of stress. It’s one thing to resist the urge to pull into a liquor store on the way home from work, but knowing that alcohol is always just a few steps away can quickly drain an alcoholic’s willpower. Having alcohol at home increases the chances of secretive drinking. After all, sneaking a few ounces of vodka can easily be disguised by adding a bit of water to the bottle. Even moderate drinking on your part can trigger cravings in your alcoholic spouse. Part of the struggle with maintaining sobriety is keeping alcohol out of sight and out of mind. A seemingly innocuous glass of wine enjoyed at dinner can reignite the compulsive thought patterns of a recovering alcoholic. Hosting a party at your home where alcohol is being served reinforces the idea that drinking and being social go hand in hand. If your spouse is the only one at the party not drinking, they can begin to feel isolated from friends and family. Learn as much as you can about what your spouse is going through, and what it means to be an alcoholic in recovery. By talking with your spouse, you can get a better understanding of what their triggers are, and how they can be avoided. Depending on your partner and their specific history and situation, it may not be unreasonable for you to decide to keep alcohol in the house, but you should speak with your partner about taking the necessary precautions. Perhaps they’re fine with you keeping a bottle of wine out in the open, or they may prefer you keep any alcohol locked up and out of sight. 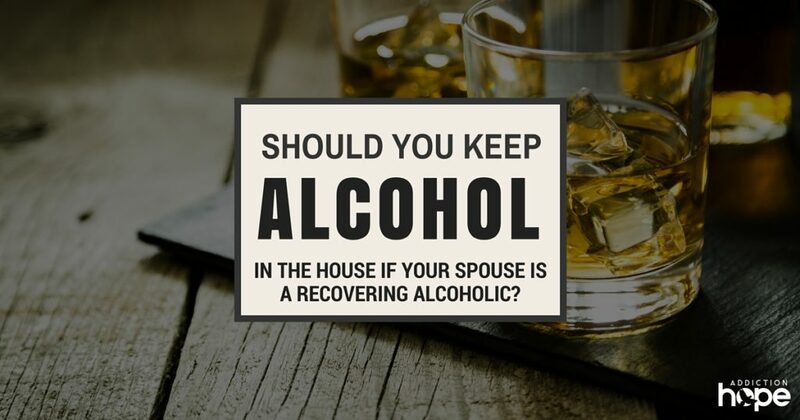 Your spouse may request that your home be completely alcohol-free, in which case it is up to you to decide whether or not you are willing to make that sacrifice. Maintaining an ongoing dialogue with your spouse about the role alcohol plays in your life is a necessary step in reaching compromises. For example, there may be special occasions where serving alcohol at home is non-negotiable. In these cases, you can make sure that there are plenty of non-alcoholic beverages available for your spouse to enjoy. You could even agree to abstain from alcohol yourself during these events so that your spouse will not feel like the only sober person in attendance. If your spouse is simply unable to face the temptation of having alcohol in the home, you should be understanding of their decision to skip the event. Living with a recovering alcoholic can be challenging, and may require you to make lifestyle changes of your own, but by being honest and supportive of your alcoholic spouse you can help them achieve full and lasting recovery. Increase Your Alcohol Abuse Knowledge And Share Your Opinions! Increase your familiarity on alcohol abuse causes, stats, signs and side effects. Remember, knowledge is power and your spouse needs all the help they can get to achieve a successful recovery and long-term sobriety. Do you have a partner who is a recovering alcoholic? Do you keep alcohol in your home? What are the pros and cons you’ve encountered? Share your thoughts and opinions below!